Christmas is usually a season for bazaars, and this 2008, it will be no different. As early as now, I’m sure many entrepreneurs are already quite busy preparing and joining the upcoming bazaars all around Metro Manila. So if you have anything to sell and would like to earn some extra income this holiday season, then I suggest you check out the Christmas 2008 Bazaar Events for Metro Manila below. Contact details of the organizers are provided whenever available. For the Christmas bazaars with no information, please contact or go to the stated venue and inquire from the admin office to know how you can participate. Also, if you’re a bazaar organizer and you would like your event to be added on the list, simply leave a comment and I’ll update the post as soon as possible. Anyway, here’s the bazaar schedule for Christmas 2008 in Metro Manila. Enjoy your shopping and don’t forget to haggle! Fridays, Saturdays and Sundays from November 21 – December 21. For more information, browse down to this link. Yuletide Souk – The Big Red Bazaar! Thanks to Byahilo for the information on some of the bazaar schedules. To receive more updates on events and great income opportunities, please subscribe to Ready To Be Rich. Thanks sa info kapatid. Kelangang shopping na tayo ng maaga di ba. Naku, kelangan nga magshopping ng maaga. 😀 Mahirap pag sa Christmas rush pa nag shop. Calling all BAZRISTAS, join now and be part of this year’s last minute Christmas shopping! wth over 150 slots to choose from Men’s, Ladies, Children’s Apparel, Toys, Novelties, and delicacy. Hi there! i checked out your friend’s blogspot and i saw my fave goodies – the revel bars! not only that, it was tagged as bestsellers! hmmm…. im dying to get my share! where is your next stop bazaar? Hi dahlgren. You don’t have to wait for our next bazaar, you can just contact him and order anytime. Thanks! I don’t really know so I just added them because the person started to email a mailing list claiming I didn’t credit her. hi.. would like to inquire about the contact details ng Karl Edwards Bazaar and Hotel Intercon Bazaar..
Do your Christmas shopping at Project Brave Kids’ SECRET SANTA BAZAAR, 29-30 November 2008. Proceeds of the 2 day event will go to the chemo treatment of children fighting cancer – allowing you to anonymously give each one of them a gift of hope this holiday season. Secret Santa Bazaar is organized by Project: Brave Kids in cooperation with Ortigas Foundation Inc.
let me know if you want to resell surf detergent powders. it’s only 35 per kilo. it’s not home-made, we are getting it from the unilever factory in manila. What: The pAMAsko Bazaar is an annual project of the Ateneo Management Association that caters to both Christmas shoppers and interested concessionaires. It is always held in the busiest places in the metro during the yuletide season. With two successful years under its belt, it hopes to continue its commitment in organizing bazaars. This year’s bazaar will be entitled pAMAsko Bazaar ’08: One Big Bazaar which will be held in the Delicacies and People’s Village in Tiendesitas. Different advertising efforts are being made to promote the event. The event will be broadcasted in radio stations. Flyers will also be distributed to nearby villages (Greenmeadows, Valle Verde 1-6, Acropolis, Corinthian Gardens, White Plains, and Blue Ridge A&B), offices and parking areas (Tiendesitas and Greenhills). To further publicize the event, tarpaulins will be placed in visible areas in Tiendesitas and Greenhills. This will increase foot traffic in the event because it is promoted directly to the bazaar shoppers. Online promotions will also be done. Moreover, we have planned different activities for all bazaar goers may it be students, professional, or families. Do you have any info about the DBP Bazaar? Schedules and contact no. of the organizers. We are interested to join. Thank you. COME TO MANILA OCEAN PARK CHRISTMAS BAZAAR 2008!!! Featuring local and imported products. Call 567-7777 for more details. MBCI in cooperation with the Network for Enterprising Women (www.newomen.net) and Working Mom magazine is presenting The Network for Enterprising Women Bazaar. This event will be held at Mandarin Suites, 4th Flr Gateway Mall, Araneta Center on November 15 & 16 and December 6 & 7 from 10AM to 8PM. It will showcase our members’ different businesses as well as introduce other business ideas. It is also open for non-NEW members. This project aims to be a venue for facilitating opportunities for trade and development between existing and aspiring entrepreneurs, business oriented organizations and the potential market. Through this project, MBCI, NEW, and Working Mom, hope to promote the values of social responsibility, youth collaboration and leadership. Admission is FREE. Participant fee for two (2) days is P7,000 per table. Concessionaire who wishes to avail of a “wall space” will be charged an additional amount of P500. Area is 2.0m x 2.0m. We will be providing the tables and chairs. Members of NEW get a 10% discount. We will also be providing a credit card facility for this bazaar. Interested parties must accomplish and e-mail the registration form to mbci.events@gmail.com. If you do not have a website, we may possibly ask you to present your products. You may call 986-3580 or 0917-5408697 / 0922-8821075. Feel free to log on to http://www.mbcievents.multiply.com for more details. For more information and booth reservations pls. call 09209174712 or 599-7000 local 1046, 2050, 2007 and look for Rayne Miranda. Are you too tired to cook after a long day at work? Want to party but not the hassle that goes with it? Unexpected office luncheons or dinner meetings? Potluck, anyone? Manila Catering To-Go is the answer. Express food WHERE you want, WHEN you want and HOW you want it. Conveniently packed in aluminum trays for 5, 10 and 20 persons delivered freshly cooked right at your doorsteps. What’s more, we offer a variety of thematic menus so you can take your palette on a tour – Japanese, Asian-Oriental, Continental, American and Spanish, prepared and cooked with the same quality and taste trademark of The Manila Catering Services. For a more elaborate celebration, we also rent out basic catering resources – waiters, tables, chairs and other utensils & equipment. Don’t let the details get you down. Manila Catering To-Go provides all these for your convenience. You deserve no less. Home style cooked food delivered at your convenience anytime, anywhere within Metro Manila. Dial 415-8777 and call in your orders! Hope you can share the convenience with your friends! The Manila Catering To-Go, a convenient answer to your express food needs! We deliver! Want home cooked meals but too tired to cook? Too stressed to organize a party for 20? Don’t get frazzled! We’ll save you the hassle. The Manila Catering To-Go delivers! Enjoy freshly cooked meals anytime,anywhere! Just dial 4158777 for your orders or email us at manilacatering@gmail.com for a complete menu list. Come join or SELL at a one of a kind 4 in 1 bazaar madness… at the La Vista Vintage Bazaar II. We have New Items, White Elephants, Cool 2nd Hand Items, UKAY-UKAY, Used Electronics, and Great Food! Time: 8:00am to 8:00 pm. Holy Spirit Drive corner Don Jose St., Diliman, Q.C. Greetings! I sell high quality trendy edgy graphic tees for male,female and kids wholesale and retail.Buyers are welcome to inquire.Ask for Lala at 7141674. Thanks a whole bunch. hello,i am lawrence of JCM exhibits depot..
for more inquiries and info you my call or txt me at my number.. I would like to invite everyone to join our bazaars! 4) The Clubhouse,Corinthian Hills,Temple Drive Every Sat. & Sun. 1st come 1st serve basis only. i would like to invite u all at the Ayala heights quezon city christmas bazaar! !its a one of a kind bazaar!!! !c u all there!!! Hi! You have a very informative site! I hope you can help promote my school organization’s project. It would really mean a lot. 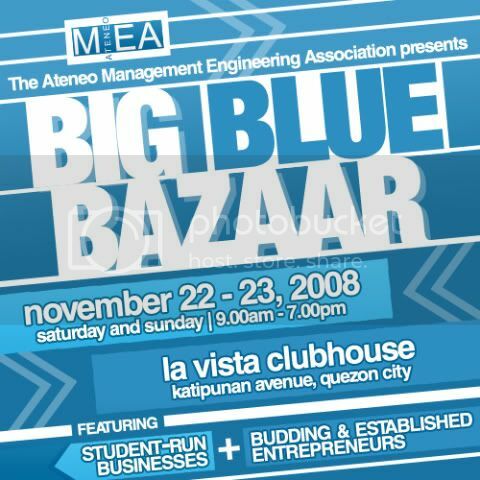 Big Blue Bazaar is a project of the Ateneo Management Engineering Association (MEA). This two-day event aims to showcase a variety of booths that offer food products, clothing and accessories, interactive activities, and valuable services. The bazaar will not only feature budding and established entrepreneurs, but also highlight student-run businesses. Please do come and visit! Or be a concessionaire for as low as P3,000 (2 days)! i am selling CALGON & The Healing Garden products( body mist, body wash, body scrub,2-in-1 body wash/lotion,lipgloss, all in various sizes and packaging with more than 25 scents to choose from ) Both MADE IN USA at very very low prices, a lot lower than their selling price in US stores!! !NOT OVERRUNS, NOT EXPIRED, ALL ORIGINAL!! !These are actually for my dealers but just for xmas season, im offering disc retail prices!! !in packs & gift boxes!VERY IDEAL for Bazaars, obviously imported packaging @ very low cost! 4278984 /09189231481 SALAMAT! where in meralco avenue is mega tent? any landmark? hi… i will have a bazaar next week.. my contact for RTW’s backed out… anyone who sella rtw for consignment? or whole sale? 4 p.m. – 12 m.n. Sun.-thurs. 4 p.m. – 2 a.m. Fri – Sat. For more information, please contact Mr. Jack at 0927-7404-093. Be part of Metrowalk’s Yuletide Bazaar! The Bazaar will start on December 8 – January 6, 2009.For more information, please contact Mr. Jack at 0927-7404-093. Anyone willing to share booth rental pm your email add or contact no. December 11 & 12, 2008 – thurs. & fri.
· We have a wide-array of products for all your Xmas shopping needs: Christmas décor, handicrafts, ceramics, import quality house décor/accents, clothing/garments/apparel, accessories, food products, health beauty and lifestyle products, and other gift items! · We offer enticing add-on experiences for the shoppers: a lively, festive and warm community atmosphere – featuring live and mixed music, treats for the kids, raffle promos and giveaways, and culinary experiences that allow for reminiscences as well as new adventures for the discriminating palate! · We are strategically located – with high-visibility along Alabang-Zapote Road, the main transportation channel of the City and a gateway to nearby Alabang, Paranaque, Cavite and nearby provinces of the South. · We are accessible to shoppers and buyers from more than 250 residential subdivisions in the City of Las Piñas. · Be with budding and established entrepreneurs, and while at it, lend support to community-run businesses and livelihood efforts. We especially call on Las Piñas residents who are running their business outside of Las Pinas City: BRING IT HOME! Showcase your products and services closer to home. Reach fellow residents through our weekend bazaars. Allow us to support your business and get inspiration from your efforts and success! We invite all exhibitors to join our A Bazaar@ Ayala starting January 12, 2009, 8am-8pm except weekends. We are located at the Ground Floor of 6797 Ayala Avenue cor. Rufino St. fronting Rufino Tower and beside SMART. We provide boolth system with meshwire, 1 table and 1 chair. Please bring extra if needed. 9500Php corner booth 9000Php inner booth per 5 days every payday week. 7500Php corner booth 7000Php inner booth per 5 days of nonpayday weeks. Pls call 5639470, 4089778, 09274566991, 09065713695 and 09234166676. Only 1000Php downpayment to reserve a booth. Balance upon pullout every Friday. Pls email me your email ad so we can send you the bazaar layout. Thank you and GOD bless! Hi sam, I’ll be posting the Christmas Bazaar 2009 schedule by first week of August. Thanks! for ONLY 266.00 A DAY! call now and reserve your slots! Santa’s Village Bazaar is finding concessionaires!